or , according to whether or not the locations belong to the same hemisphere. The Earth is, of course, assumed to be a perfect sphere. Actually, it is slightly oblate, with the equatorial radius approximately 21 km greater than the polar radius, but this contributes a negligible correction. The latitude is positive in the northern hemisphere and negative in the southern hemisphere. The east longitude is positive and the west longitude is negative. Examples of time zones: Paris (France): , New York: . Latitudes are limited below the Arctic circle and above the Antarctic circle: . Snapshot 1: The date is February 10, 2011. Location 1 is Lafrançaise (France), latitude , longitude , noon is at 13:9:16 local time, . Location 2 is Meerut (India), latitude , longitude , noon is at 12:33:28 local time, .
. The distance between the parallel of Lafrançaise and the parallel of Meerut is km, which gives 40030 km for the Earth's circumference. Reported measurements are , . You can find details on Lafrançaise (France) at  and on Meerut (India) at . Snapshot 2: This case reproduces Eratosthenes's original measurement of the Earth's circumference in Alexandria and Aswan on summer solstice. The date is June 21, 2012 (summer solstice). Location 1 is Alexandria (Egypt), latitude , longitude , . Location 2 is Aswan (Egypt), latitude , longitude , . 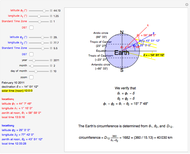 Actually, the latitude at Aswan is , but we use the latitude of the Tropic of Cancer ( ) to agree with Eratosthenes's knowledge that at Aswan, on the summer solstice (June 21) at noon, the sun shines straight down a well. The distance between the parallel of Alexandria and the parallel of Aswan is km, which gives 40030 km for the Earth's circumference. Eratosthenes assumed that Alexandria and Aswan belong to the same meridian; the small difference in longitude explains the slightly different local noon times. 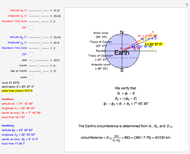 Eratosthenes found stadia and measured , which leads to the Earth's circumference being 39250 km, assuming a stadium value of 157 m .
Snapshot 3: The date is August 13, 2012. Location 1 is Paris (France), latitude , longitude , noon at 13:55:31 local time, . Location 2 is Rio de Janeiro (Brazil), latitude , longitude , noon at 11:57:343 local time, .
. The distance between the parallel of Paris and the parallel of Rio de Janeiro is km, which gives 40030 km for the Earth's circumference. Snapshot 4: If Eratosthenes had lived in Brazil, he could have measured the circumference of the Earth in São Paulo (almost on the tropic of Capricorn) and Porto Alegre on the summer solstice (December 21 in the southern hemisphere) and obtained the same result. "Eratosthenes." (Oct 4, 2012) www.eratosthenes.eu/spip. 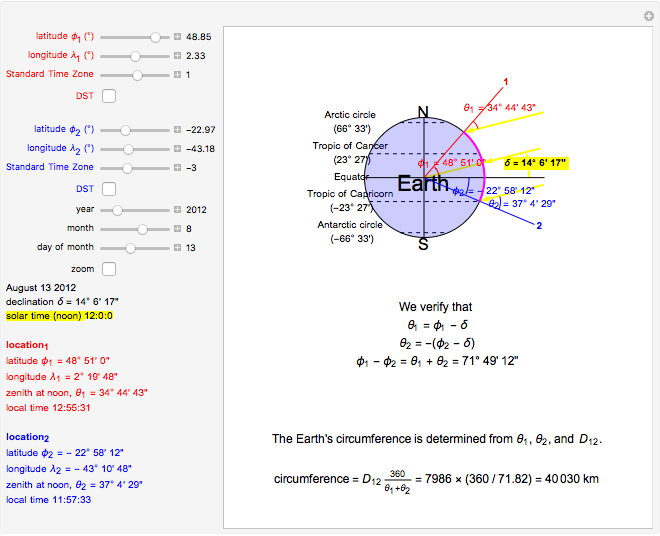 "Eratosthenes 2010–2011." (Oct 4, 2012) eratosthenes2010.free.fr/spip.php?article78. 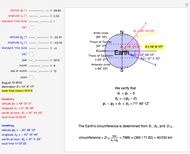 "Eratosthenes 2010–2011." (Oct 4, 2012)eratosthenes2010.free.fr/spip.php?article79. Wikipedia. "Eratosthenes." (Oct 4, 2012) en.wikipedia.org/wiki/Eratosthenes. W. B. Stine, M. Geyer, and S. R. Stine, Power from the Sun, Chap. 3, "The Sun's Position," 2010. www.powerfromthesun.net/Book/chapter03/chapter03.html#Equation%20of%20Time. Time and Date. "The World Clock." (Oct 4, 2012) www.timeanddate.com/worldclock. The GPS Coordinates Search Engine. (Oct 4, 2012) www.thegpscoordinates.com. Philippe Brosson "Calculating the Earth's Circumference at Any Date from Any Location"